We Are Always Learning! - George Lindemann Jr.
For the past 9 years, I’ve had the unique privilege of serving as the President of the Board of Directors of The Bass. It’s been a time of transformation, growth, service and, of course, learning. We are always learning at The Bass. In fact, one of the things that compelled me to get involved with the organization was its commitment to supporting education for all visitors and in all forms. I was a part of the team that worked with Stanford University to develop The Bass IDEAS education initiative which uses art as a catalyst for creativity and positive growth, especially in the area of early childhood education. This program has served as a model for museums worldwide and it is something we’ve built upon in Miami. While our museum was closed for renovations, our IDEAS work and our commitment to education didn’t stop. We used this time as an opportunity to try something different – to go out into our communities and keep learning. Building off our IDEAS program and with support from the Kellogg Foundation through a 3-year grant, The Bass launched Creativity in the Community. The program set out to engage families and their children in undeserved Miami-Dade County neighborhoods. The idea was simple yet the implementation was transformative both for participants and for us. With Creativity in the Community, we fanned out into areas with limited access to the arts and brought programming to their communities. Working with partner organizations – other nonprofits, local libraries, community centers, etc. – we created and hosted six-week long courses in their neighborhoods. The courses provided literacy lessons and accompanying art activities for parents and kids to do together. We discovered early on that just creating time and space for parents and kids to engage in learning together – as a shared act – was beneficial. We also found that meeting these families where they lived – quite literally in their communities – made the program more accessible and more appealing. Even better, we found once we opened that doorway parents remained more involved and felt more empowered to help their children grow, learn, and express themselves. Key to our vision was recruiting members of the community to serve as program ambassadors and teachers. During the course of the program grant, we trained more than 23 ambassadors and many of these were parents who first took the course with their children and wanted to remain engaged in the community initiative. By training parents and by modeling ways of engagement that could be replicated in the future, we were ensuring that our efforts could live beyond the timeframe of any particular grant. Learn more about Creativity in the Community from Bass Museum of Art on Vimeo. During the three years, we partnered with 59 organizations in the community. 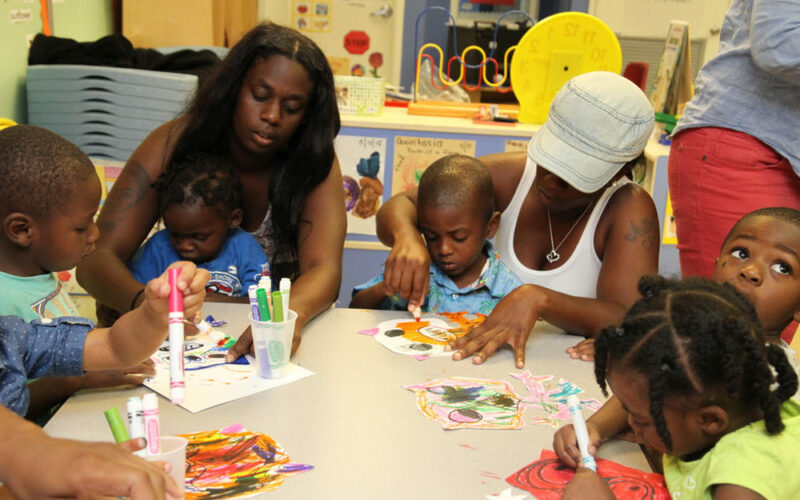 1,365 children and 1,160 parents participated in our six-week workshops and more than 28,155 kids were served overall through 25 activations at school and community fairs per year by The Bass to bring art and literacy enrichment activities to families. Primarily our program served kids 2-8 in Little Haiti, Little Havana, Miami Beach, North Miami, and Overtown. Our desire to empower members in the community through our ambassador model and to have a lasting impact by building their skill base and participation level paid off. Although our grant period has ended, three Miami Dade public libraries are keeping the program going in their communities. Creativity in the Community remains at the main library, the North Shore Branch and North Dade Regional. We are proud of what we accomplished during the grant period and what continues to live on. And now that The Bass has reopened its door with a newly expanded 4,200 square foot creativity and learning center, we hope to apply the lessons we’ve learned out in the community in our ongoing programming – by creating opportunities in which participants feel invested, by making time and space for families to engage in shared experiences, by giving parents the tools they need to be supportive, and by always keeping our doors open and welcoming to those eager to learn with us.